SIDS (Sudden Infant Death Syndrome), commonly known as ‘cot death’ is the name given to the sudden and unexpected death of an apparently healthy infant, which remains unexplained even after performing a complete post-mortem investigation. Safeguarding behaviors appear to be the supine position and the use of pacifiers [1Adams SM, Good MW, Defranco GM. Sudden infant death syndrome. Am Fam Physician 2009; 79(10): 870-4. [PMID: 19496386] ]. It also seems that children who use pacifiers have a lower awakening threshold, and a greater probability of arousal (higher probability/chance of arousal) in the event of hypoxia. Furthermore, the use of pacifiers modifies air spaces by bringing the tongue in an anterior position, a benefit that is maintained even if the baby loses the pacifier in his sleep [2Committee on Fetus and Newborn. Apnea, sudden infant death syndrome, and home monitoring. Pediatrics 2003; 111(4 Pt 1): 914-7. [PMID: 12671135] , 3Li DK, Willinger M, Petitti DB, Odouli R, Liu L, Hoffman HJ. Use of a dummy (pacifier) during sleep and risk of Sudden Infant Death Syndrome (SIDS): Population based case-control study. BMJ 2006; 332(7532): 18-22. 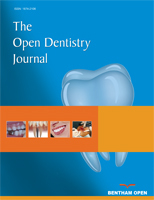 [http://dx.doi.org/10.1136/bmj.38671.640475.55] [PMID: 1633 9767] ]. In 2006, the American Academy of Pediatrics (AAP) issued some guidelines regarding the use of pacifiers and established that the latter represents a safeguard element in the incidence/impact of SIDS [4American Academy of Pediatrics. Pediatric clinical practice guidelines and policies 2014; 5: 1083-4.]. Pacifiers also have the following benefits: They do not reduce the period of breastfeeding for premature babies and children after the 1st month of life; they help premature infants throughout neurological maturation. There are also some possible risks: They may cause dental misalignments if the use is extended beyond the 2 years of age; they may disadvantage breastfeeding if used during the first month of life, before starting breastfeeding; they may determine the risk of otitis media, especially after the first year of age [5Marter A, Agruss JC. Pacifiers: An update on use and misuse. J Spec Pediatr Nurs 2007; 12(4): 278-85. [http://dx.doi.org/10.1111/j.1744-6155.2007.00126.x] [PMID: 17956 375] ]. Very similar to SIDS, the ALTE, a term introduced in 1986 during the National Institute of Health Consensus Conference on Infantile Apnea, is the acronym for ‘Apparent Life-Threatening Event’ or ‘Apparently Risky Event for Life’ (National Institutes of Health Consensus Development on Infantile Apnea and Home Monitoring, 1986) [6National institutes of health consensus development conference on infantile apnea and home monitoring, Sept 29 to Oct 1, 1986. Pediatrics 1987; 79(2): 292-9. [PMID: 3808807] ]. ALTE implies an episode that has frightened the observer, characterized by a varying association of apnea (central or occasionally obstructive), a variation of skin color (cyanosis, pallor or erythrosis), marked alteration of muscle tone (hypo or hypertonic), apparent suffocation. This episode, which usually lasts a few seconds, may occur during sleep, in waking hours or during a meal. In some cases, it resolves spontaneously, in other cases, it can be tackled thanks to the immediate intervention of a witness. In the case of more serious episodes, rescuers’ reanimation maneuvers are necessary and can escalate up to cardiopulmonary resuscitation [7Piumelli R, Davanzo R, Nassi N, et al. Apparent life-threatening events (ALTE): Italian guidelines. Ital J Pediatr 2017; 43(1): 111. [http://dx.doi.org/10.1186/s13052-017-0429-x] [PMID: 2923 3182] ]. In literature, it is estimated that about 5% of infants who have presented an episode of ALTE will die of SIDS: therefore, this data should act as an alert and not be underestimated. ALTE is not a diagnosis but represents an idiopathic clinical manifestation (IALTE, about 50%) or secondary to multiple morbid conditions. The most common causes are gastrointestinal (about 50%), neurological (30%), respiratory (20%), cardiovascular (3%), metabolic and endocrine (< 5%) or it might include other reasons, such as abuse episodes [8Kahn A. Recommended clinical evaluation of infants with an apparent life-threatening event. Consensus document of the European Society for the Study and Prevention of Infant Death, 2003. Eur J Pediatr 2004; 163(2): 108-15. [http://dx.doi.org/10.1007/s00431-003-1365-x] [PMID: 1465 2748] ]. The real incidence of episodes is difficult to define since the values reported in literature swing dramatically between 0.6 and 10 among 1000 live births [9Davies F, Gupta R. Apparent life threatening events in infants presenting to an emergency department. Emerg Med J 2002; 19(1): 11-6. [http://dx.doi.org/10.1136/emj.19.1.11] [PMID: 11777863] , 10McGovern MC, Smith MB. Causes of apparent life threatening events in infants: A systematic review. Arch Dis Child 2004; 89(11): 1043-8. [http://dx.doi.org/10.1136/adc.2003.031740] [PMID: 154990 62] ]. Most episodes occur in children under the age of one and the average age is of 8 weeks [11Mitchell EA, Thompson JMD. Parental reported apnoea, admissions to hospital and sudden infant death syndrome. Acta Paediatr 2001; 90(4): 417-22. [http://dx.doi.org/10.1111/j.1651-2227.2001.tb00443.x] [PMID: 1133 2934] , 12Montomoli C, Monti MC, Borrelli P, et al. Incidence of apparent life-threatening events and post-neonatal risk factors. Acta Paediatr 2017; 106(2): 204-10. [PMID: 26946490] ]. It is not known whether the use of pacifiers in sleep can reduce the risk of ALTE or sleep apnea in the first two years of life. Obstructive Sleep Apnea Syndrome (OSAS) in children is defined as breathing disorder during sleep characterized by extended partial upper airway obstruction and/or intermittent complete obstruction (obstructive apnea) that disrupts ventilation during sleep and fragments sleep patterns. It is estimated that 3% to 26% of children are usual snorers and 1.2% to 5.7% of the general pediatric population presents OSAS. The peak incidence was found between 2 and 8 years of age and is widely identified among the causes of a discrepancy between the size of the lymphoid tissue and airway size. OSAS takes place with the collapse of the upper airway during sleep as a result of an unbalance between the structure of the upper airway due to several factors such as adenotonsillar hypertrophy, craniofacial anomalies, the tone of the upper airway neuromuscular and obesity. The consequences that OSAS can generate are neuropsychological and cognitive impairment, systemic and pulmonary hypertension and endothelial dysfunction which all occur quite frequently. Most articles demonstrate that protruding children’s jaw reduces obstruction during sleep [13Caprioglio A, Levrini L, Nosetti L, et al. Prevalence of malocclusion in preschool and primary school children with habitual snoring and sleep-disordered breathing. Eur J Paediatr Dent 2011; 12(4): 267-71. [PMID: 22185254] ]. These considerations lead us to hypothesize that pacifiers can be a useful tool for better nighttime breathing. For this reason, the aim of the study is to evaluate how pacifiers impact sleep apnea during the first two years of life in children with a history of ALTE. Within the experimental group, the basal recording without pacifiers showed an average of 3.2 pathological apnea/night, whereas with the use of pacifiers, the average result was 1.5 pathological apnea/night: in all cases, there was a significant reduction in nocturnal apnea events (p-value 0,0024). Only when mothers reported the impossibility of using the pacifier, there was no positive impact. Therefore, the use of the pacifier resulted in a reduction of pathological apnea cases/night (-1.7%), a nonstatistical improvement in the average SpO2 (+ 0.8%) and an increase in the value of the minimum SpO2 (+ 2%) (Table 1). In most cases (90%), there was a linear and constant progress of the respiratory capacity, with a reduction in the number of apneas and improvement of SpO2 (Figs. 1 -3 ). No questionnaire reported problems or irritations to the skin caused by pacifiers. Average value of the two grpups, differences and t-test. 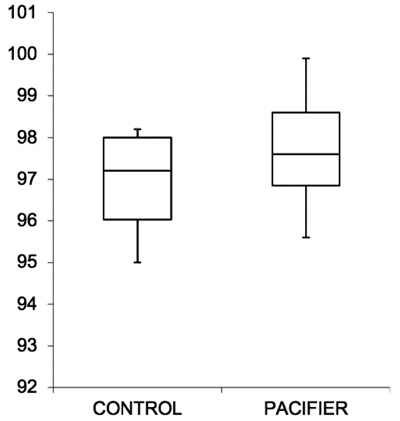 Box plot with numbers of apnea / night without (control) and with pacifier, in percentage. Box plot with average SpO2 without (control) and with pacifier, in percentage. 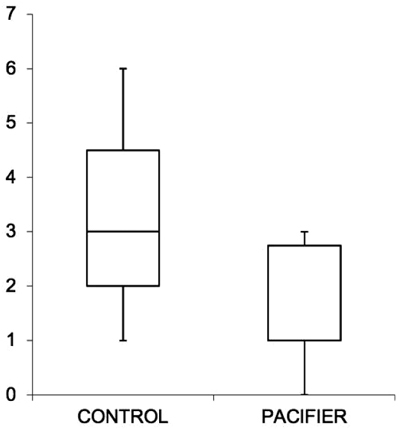 Box plot with minimum SpO2 without (control) and with pacifier, in percentage. The results of this analysis show that the use of the pacifier improves the respiratory capacity of children with nocturnal apneas at night. This effect is particularly reassuring as it enables the protection/treatment of children affected by OSAS, although it does not solve the root causes of the problem. Practically, it could be considered as an effective conservative therapy before the age of 2 in pediatric patients suffering from OSAS. Referring to the literature, the effectiveness of the pacifier in resolving minor respiratory disorders, such as nocturnal oral breathing or oral breathing during wakefulness, could be argued. Cozzi in 2002 showed how pacifiers are able to increase the breath flow in patients with oral respiration, in particular by analyzing oxygen saturation at the arterial level. The rationale of this efficacy is probably due to the jaw advancement induced by the pacifier [14Cozzi F, Morini F, Tozzi C, Bonci E, Cozzi DA. Effect of pacifier use on oral breathing in healthy newborn infants. Pediatr Pulmonol 2002; 33(5): 368-73. [http://dx.doi.org/10.1002/ppul.10087] [PMID: 11948982] ]. To confirm this rationale, Levrini and Nosetti in 2018 conducted a study on OSAS patients, applying silicone preformed oral devices with the purpose of advancing the patients’ jaw and a reduction in the hypomea apnea index was highlighted [15Levrini L, Salone GS, Ramirez-Yanez GO. Efficacy of a pre-fabricated myofunctional appliance for the treatment of mild to moderate pediatric obstructive sleep apnea: A preliminary report. J Clin Pediatr Dent 2018; 42(6): 475-7. [http://dx.doi.org/10.17796/1053-4625-42.6.14] [PMID: 3008 5867] ]. On this subject, in 2007, Tonkin showed that pacifiers in preterm births cause a significant yet small advancement of the jaw, which is stable once the pacifiers get removed. Tonkin himself has published a case of patients suffering from severe retrognathia in which the use of pacifiers produced an increase of 7 mm in the pharyngeal gold space. However, the application of a jaw advancement device such as a pacifier does not exclusively provoke a forward repositioning of the jaw but also a downwards movement; for this reason, it is better to identify it as ‘mandibular repositioning’ [16Tonkin SL, Lui D, McIntosh CG, Rowley S, Knight DB, Gunn AJ. Effect of pacifier use on mandibular position in preterm infants. Acta Paediatr 2007; 96(10): 1433-6. [http://dx.doi.org/10.1111/j.1651-2227.2007.00444.x] [PMID: 17714 544] , 17Tonkin SL, Vogel SA, Gunn AJ. Upper airway size while sucking on a pacifier in an infant with micrognathia. J Paediatr Child Health 2008; 44(1-2): 78-9. [http://dx.doi.org/10.1111/j.1440-1754.2007.01259.x] [PMID: 18086 042] ]. The mandibular repositioning devices can, therefore, contribute at improving the airflow during sleep, due to the reduction of the upper airway collapse and the improvement of the muscle tone, as suggested by Villa in 2012 [18Villa MP, Miano S, Rizzoli A. Mandibular advancement devices are an alternative and valid treatment for pediatric obstructive sleep apnea syndrome. Sleep Breath 2012; 16(4): 971-6. [http://dx.doi.org/10.1007/s11325-011-0595-9] [PMID: 2194 8042] ]. The rationale of these phenomena is to advance the jaw and tongue in order to have a positive impact on the caliber and function of the upper airway [19Chen H, Lowe AA. Updates in oral appliance therapy for snoring and obstructive sleep apnea. Sleep Breath 2013; 17(2): 473-86. [http://dx.doi.org/10.1007/s11325-012-0712-4] [PMID: 2256 2263] ]. This may be due to the fact that children’s upper airways reflect the concepts of the Starling resistance model, with a complex multi-system involvement to regulate patency. The Starling resistance model can be described as a tube with a rigid proximal and distal component but with a flexible central portion. This flexible region is exposed to the surrounding tissue pressures and collapses if the pressure of surrounding structures increases. The term used to describe the moment in which the pressure of the pharynx decreases is Critical Pressure (PCRIT). In order for the flexible portion to remain previous, the pressure in the proximal and distal segment must be greater than the PCRIT. To create a complete occlusion, the upstream and downstream pressure of the flexible segment must be lower than the PCRIT. However, limited respiratory flows (hypopnea) take place if a certain flow of air is maintained during inspiration, with the upstream pressure remaining higher than PCRIT. This pattern occurs during severe snoring episodes, by which the airflow fluctuates during closure and reopening of the upper airway [20Schwengel DA, Dalesio Nm, Stierer Tl. Pediatric obstructive sleep apnea. Anesthesiol Clin 2014; 32(1): 237-61. [http://dx.doi.org/10.1016/j.anclin.2013.10.012] ]. According to this theory, we can assume that pacifiers could increase the PCRIT in the upper segment, but not enough to bring the flow back to the highest PCRIT values. Nevertheless, pacifier use should not be underestimated as the jaw advancement in growing subjects determines a positive stimulus to the growth of the mandibular body. Cranio-facial morphology plays a key role in the pathophysiology of Pediatric Obstructive Sleep Apnea Syndrome (OSAS). Upper airway obstruction, as a result of hypertrophy of lymphoid tissue or skeletal deficiency in a growing child, can prompt oral breathing, endangering normal craniofacial development, resulting in a reduced upper airway thickness and promoting breathing disorders during sleep. Therefore, it is reasonable to affirm that pacifiers generate an immediate relief but can also be a treatment for the stimulation of the mandibular growth and, as a consequence, for a stable opening of airway spaces, useful for correct breathing behind the tongue. However, in accordance with other studies [21Jackman AR, Biggs SN, Walter LM, et al. Sleep-disordered breathing in preschool children is associated with behavioral, but not cognitive, impairments. Sleep Med 2012; 13(6): 621-31. [http://dx.doi.org/10.1016/j.sleep.2012.01.013] [PMID: 2250 3657] ], it is theoretically possible that snoring itself is a more serious respiratory phenomenon in young children than apnea or hypopneas. If snoring causes significant physiological changes (eg, inflammation) to an equal or greater extent of apneas and hypopneas, children with Primary Snoring may not actually be affected by a ‘mild’ form like children with OSAS. Obviously, the protective and preventive role that pacifiers play with SIDS should not be underestimated, especially in studies that describe the mechanisms and underlying this specific benefit [22Alm B, Wennergren G, Möllborg P, Lagercrantz H. Breastfeeding and dummy use have a protective effect on sudden infant death syndrome. Acta Paediatr 2016; 105(1): 31-8. [http://dx.doi.org/10.1111/apa.13124] [PMID: 26175065] ]. Based on our results, it has not been demonstrated that the etiology of the problem has been resolved [23Nazarali N, Altalibi M, Nazarali S, Major MP, Flores-Mir C, Major PW. Mandibular advancement appliances for the treatment of paediatric obstructive sleep apnea: A systematic review. Eur J Orthod 2015; 37(6): 618-26. [http://dx.doi.org/10.1093/ejo/cju101] [PMID: 25681125] ].